The Olympics may be coming to a close in London, but the Metro Library’s Primary Resources Blog is serving up a local double-header of Olympics history. Back in 1932, Los Angeles welcomed the world to a much smaller affair during the Great Depression. (Only 1,500 athletes from 37 nations took part, with the Olympic Village in Baldwin Hills). The Metro Library’s Primary Resources blog explores in depth how the the city moved athletes and spectators around 80 years ago — when L.A. was criss-crossed by the streetcars and interurban rail lines of one of the largest transit systems on the planet. Fast forward a half-century: Los Angeles welcomes the world back, despite that rail system having been completely dismantled for more than two decades. How did Los Angeles transport athletes, spectators and millions of local residents through the first Olympics staged in a city without a rapid transit system since 1960? 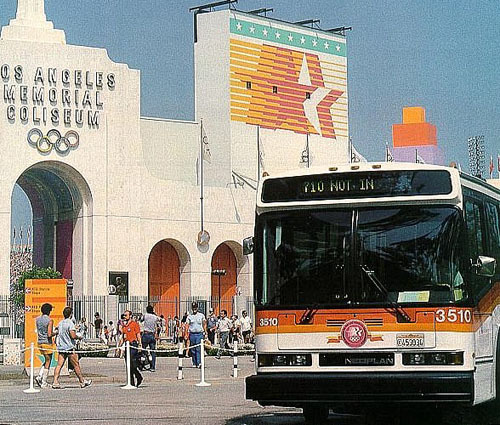 Primary Resources takes an extensive look at how L.A. managed to pull off a Olympic-sized feat in 1984, greatly reducing traffic and smog throughout the region thanks to a comprehensive transportation plan built entirely around a fleet of buses. Westside Subway Extension secures Record of Decision from feds, a big step forward for a big project! very interesting read. wouldn’t it be great if LA hosted the games a 3rd time, and with an expanded rail and bus system. LA will need a direct rail link from LAX to Downtown LA first if we’re ever to host the Olympics again. The sheer size of the Olympics of today can’t compare to when we hosted it back in 1932 and 1984. How will the all athletes, judges, officials, VIPs, journalists, and tourists from all over the world going to go to the Coliseum and other LA sports venues once they arrive? Hop onto a rental car shuttle and rent a car from Enterprise? Jam pack a close to a quarter of a million temporary residents to LA into buses and light rail? New York and Chicago has a better shot at hosting another Olympics than LA so long as we refuse to build a direct rail link to LAX. I’m from NYC & I remember the ’84 Olympics from watching on TV. The Olympic Games are different today because (a) there are many more sports that have been added in the 28 years since the LA Games (beach volleyball & women’s soccer among the sports added) (b) Liberal Transit Supporter is right in writing that a direct rail link from LAX to downtown LA is necessary. One of NYC’s biggest drawbacks is that there’s a limited rail connection from JFK & Newark airports (automated peoplemover systems operate from the two airports to a nearby commuter rail station in both cases; the JFK system does connect to the subway in Queens) and zero rail from LaGuardia. [The real reason the Big Apple lost out to London for this year’s Games, however, had more to do with the lack of an Olympic Stadium than a limited rail link from the two international airports.] London has two separate rail links from Heathrow & one from Gatwick. Chicago (the city that lost out on the 2016 Games to Rio de Janeiro) has subway lines that go to O’Hare & Midway. Should our nation’s capital make a serious bid for the 2024 Games, Washingtonians (and athletes & tourists from around the globe) will be able to hop on the Metro from Dulles International Airport [DC already has a line that goes to National Airport].